Everyone has a best friend for whom the door is always open, invariably inviting them to pop in unexpectedly. 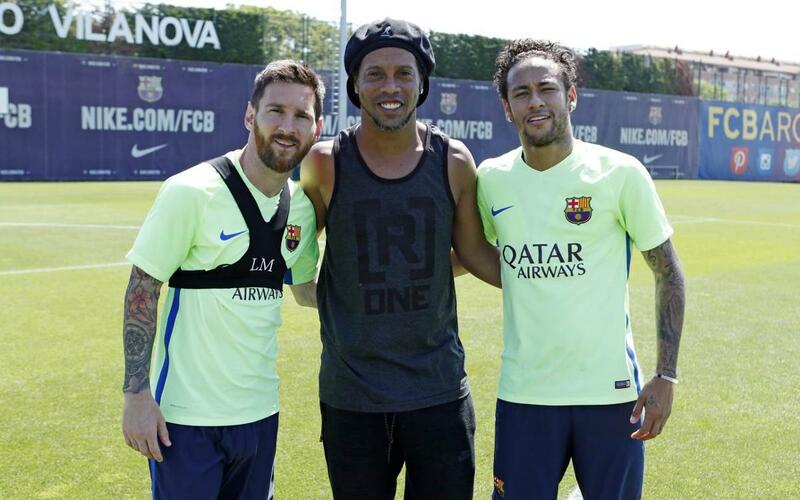 For FC Barcelona, that friend is Ronaldinho. On the day Barça returned to training to begin readying for Saturday's Copa del Rey final, the former Barça superstar made an unannounced visit to the team's training facility, where could be found out on the field, chatting with the many players and coaches he has maintained friendships with over the years. "It's always good to meet up with great friends," he said. "It's a huge pleasure." The former blaugrana striker, who won the 2005 Ballon d'Or, wore his habitual ear-to-ear smile as he exchanged high-fives and posed for pictures with the likes Lionel Messi and fellow Brazilian Neymar Jr., among others. He also spoke about Barça's final match of the season, Saturday night's Copa del Rey final versus Alavés. "[The players] look good to me, very motivated," he said. "It's going to be a great game, I hope that luck is on their side and that everything goes well." Stopping in to say hello, Ronaldinho said, "always gives me a lot of joy. They're very good friends, and it's always a pleasure to be with them."